If you're a newcomer to this field, this is the session for you. If you are an old timer, this session will remind you of all those other things you could be measuring. We're awash in data, and we have the ability to track consumer behavior like never before. However, collecting mountains of behavioral, demographic and attitudinal data comes with its own set of responsibilities. How should we, as an industry, practice ethical analytics? 10:45 Customer Centric Decision Making: Steps for Foundational Web Success. With websites quite literally drowning in data how do you ensure you are attuned to your website customers? How do we move beyond standard Clickstream analysis? How to effectively influence senior management with KPI�s and Dashboards? In his talk Avinash shares insights into Intuit�s Trinity platform that integrates Qualitative and Quantitative data to solve for the customers. He will also highlight process improvements and standard dashboards that help Intuit move the right dials for win-win outcomes. What can web analytics do for a web site that is not used for e-commerce? One used to attract sales opportunities for a low-volume, high dollar software and services business? Careful examination and measurement of the entire lead generation process is required, acknowledging what works and what doesn't work. Caine will cover ProSight's journey as they learned to attract leads over the web, qualify them, and then measure the impact on the sales cycle. Should all site visitors be weighted equally? FordDirect found that it could predict with outstanding accuracy the site visitors who were most likely to convert to sales by studying their online activity. Leveraging this data to optimize site design to better meet targeted consumer expectations, Ford and FordDirect were able to double lead conversion and sales. Current efforts focus on extending these learnings throughout the entire organization, from upstream production planning activities, to downstream sales and marketing. Web 2.0 is all about social interactions and viral marketing. To grow fast, cash-strapped startups need to make the best use of their marketing dollars and carefully monitor how their service is used and propagated. In this session, radical new web analytics measurement techniques will be debated. Cisco is one of the world's most online companies even though they sell physical stuff. But all of their prospects and all of their customers have always been online and Cisco has been keeping track of their behavior. Here's a rare chance to hear how Cisco quantifies success using web metrics. 9:45 Measuring Rich Internet Applications. More websites are being developed with Flash or AJAX. You can gain a complete understanding of users' behavior from search engine keywords to conversion by integrating an interactive event model to produce meaningful business results. Igor divulges how dthree tracks all-Flash websites such as Beer.com (including Virtual Bartender), InBev Brands and Stella Artois to optimize online marketing and consumer acquisition results. The latest marketing tug-of-war is between the "push" and "pull" approaches. The metrics behind push marketing are pretty well understood by now; but what are the business models and metrics for pull marketing? Since pull relies heavily on the web for execution, you need to wrap your head around the analytics. When do you push and when do you pull? How can you tell when the customer is going to let go of the rope and leave you flat on your back? Make sure you understand the implications and analytics of pull before you become a two-headed (and two-faced) marketing llama! Each major sponsor gets a precious few minutes to distinguish themselves. Sometimes entertaining - always informative. Our worthy sponsors identify themselves and then the floor is open for Q&A. Previous session questions included, "If you weren't in business, which tool would you use?" and "Where do you see this industry in five year's time?" Every direct mail marketer knows about A/B split testing. Now it's time to step up to multivariate testing. Scott walks through the process and steps required to execute a successful multivariate test, using RealNetworks as the case to be studied. Methodology, technology and lessons learned. Josh digs into how companies are leveraging multi-channel data to create significant value online and off. He'll discuss best practices with specific examples of how companies are merging data from the web with in-store customer transaction data, call center data, offline marketing data and other data sources. Don't you wish you were one of them? Do you run an ecommerce site? A publishing site? A lead generation site? Sit down with others in your same boat and find out what the best Key Performance Indicators might be for you. The annual WAA Member Meeting is open to all. help you and how you can participate. Getting buy-in is tough, especially in a decentralized organization and once the team says �yes�, you have to deliver the goods. With reporting critical to the web analytics test & measure cycle, how do you get the right report to the right people at the right time? Clint will show us the lessons he has learned designing effective reports at Disney. 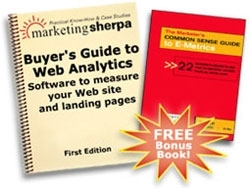 Get up close and personal with the leading web analytics tools. Get a demo, compare notes, see how they stack up. Microsoft's Live.com is a new, powerful RSS reader and customizable homepage which gives users the ability to control their Internet experience. How have users responded? Do they like the design? Is it easy to use and customize? And how do they measure all of this? By tracking customer feedback. Microsoft asks customers to rate attributes like content, design and usability, and evaluates all responses with a linguistic analysis tool to get the most out of this rich, unstructured data. Jessica will wall us through the value of listening to the voice of the customer. Analysts and Business Owners hear all too frequently that �you cannot improve what you cannot measure.� How much more important, then, is it to understand the complete vocabulary for what you�re measuring? The inventor of Persuasion Architecture (TM) guides you through the full vernacular of funnel metrics, persuasive scenario design and its specification via the PAXML. Every delegate received a copy of Eric T. Peterson's latest books: Web Site Measurement Hacks and The Big Book of Key Performance Indicators.